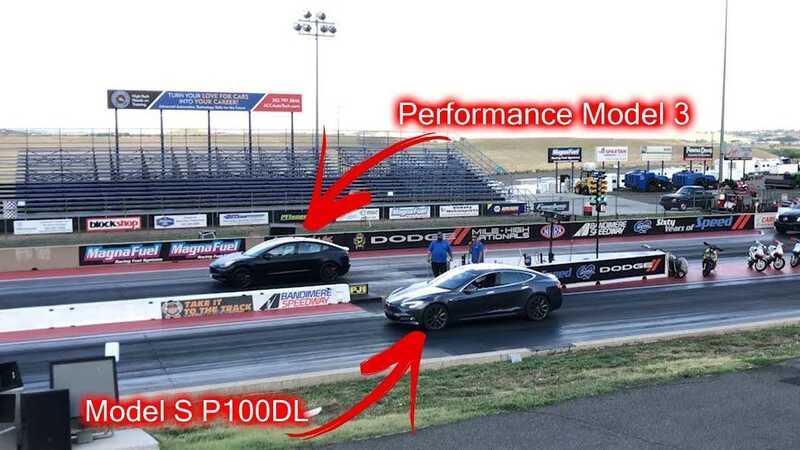 How do these three Teslas fare at the drag strip? Colorado-based YouTuber Erik Strait (DAErik) is back out at Bandimere Speedway, this time with his Tesla Model 3 Performance, a Model X 100D, a Model S P100DL, and a Dodge Challenger. Bandimere -- known by the NHRA as Thunder Mountain -- is located partly up the Rockies in Morrison, Colorado, not far from Denver. As we noted before, Thunder Mountain's ~ 5,814-foot elevation gives a nice advantage to EVs. Traditional ICE cars will find performance hindered at higher altitudes due to the thinner air. This problem may be able to be solved by way of a turbocharged or supercharged engine, though the best solution is to drive a Tesla! In the first race, the Tesla Model 3 Performance faces off against the Model X 100D. You can probably guess how that one turns out. Next up, the 3P lines up next to a Dodge Challenger R/T, which is powered by a 375-horsepower Hemi V8. We won't spoil that one for you either, however, we will say that if you're a Tesla fan, you'll be happy with the results. The final race features Erik in his Tesla Model 3 Performance versus a Tesla Model S P100D with Ludicrous. You'll have to watch to see what happens in that one. Let's just say, we think they'll be doing it over again very soon.